The Archers of Teme club is based between Ludlow, Leominster and Tenbury Wells on the borders of South Shropshire, North Herefordshire and Worcestershire. It is one of the oldest clubs in the county, originally formed in 1856** and is affiliated to Shropshire. The present club was reformed in 1984. We are a medium-sized club with an active membership. Although most members shoot recurve bows we have a few compound archers and a growing number of longbows. The club is based at the Brimfield & Little Hereford Sports Club to which we are affiliated. During the summer months we shoot on Sunday afternoons from 2.00pm to 5.00pm and also on evenings during the week. In the winter we shoot indoors at Moor Park School where we also have a small field archery course and the opportunity for clout shooting. Some members of the club attend local and national competitions but many are happy just to shoot at club sessions for the fun of it! 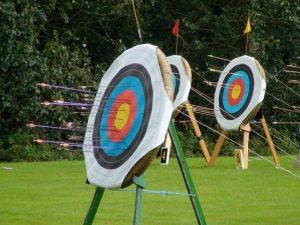 New archers of all ages are invited to one of our beginners’ courses, usually held in the Spring and Autumn, while experienced archers are welcome to join us at any time.